Sometime after 5 a.m. on Jan. 14, 2014 22-year-old Dominik Panka made European Poker Tour history by topping the field of 1,031 players in the 2014 PokerStars Caribbean Adventure $10,000,000 guaranteed main event to become the first ever Polish player to win an EPT main event. In addition to the title he also earned $1,423,096 in prize money, the trophy and a Swiss watch from official EPT watch sponsor Slyde. In addition to forever etching his name in the poker history books he also prevented Mike “Timex” McDonald from making history of his own by becoming the first player to ever win two EPT’s, a feat that has been elusive for over nine and a half seasons so far. As an 18-year-old, McDonald won the 2008 EPT Dortmund main event for more than $1.3 million. Panka defeated McDonald heads-up to cap off 16 hours of final table action and prevent him from achieving that record-setting win. The final table began with Estonian Madis Muur in the chip lead but with McDonald not far behind. McDonald was able to wrest the chip lead away after winning a number of big pots, including eliminating Argentina’s Fabian Ortiz in eighth place with Q Q versus Ortiz’s A K .
During three-handed play Baron’s stack dwindled down to just 3.8 million in chips before his final hand arose. Panka raised to 325,000 on the button and Baron moved all-in. Panka made the call with the A 9 and was ahead of Baron’s K Q . All of the tension of the sweating the run-out was diffused after a flop of 10 7 3 left Baron drawing dead, with Panka’s flopped nut-flush securing him the giant pot and sending Baron to the rail in third place ($1,207,599). 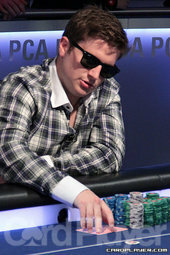 With that heads-up play began with Panka holding a slight lead over McDonald. That lead was quickly erased, and then McDonald was able to build a lead of his before the next key hand arose. Panka raised to 400,000 on the button and McDonald three-bet to 1.2 million. Panka moved all-in for roughly 13.1 million and after a moments thought McDonald called with the K J . Panka was ahead with the 9 9 , and McDonald was not able to make a better hand after the board ran out 10 8 2 8 2 . As a result of that hand Panka took the lead and from there was able to steadily increase his chip advantage until he had a lead of roughly 5-to-1 before the final hand arose. Panka raised to 500,000 from the button and McDonald went all-in for 5.4 million. Panka made the call with the A 2 , which was ahead of McDonald’s 7 4 . The flop didn’t really change much as it brought the J 5 2 , but the 7 on the turn put McDonald in the lead and made him a big favorite to double up and keep his dream of making EPT history alive. The A on the river dashed those hopes however, sending McDonald to the rail in second place ($1,064,865) and securing the title for Panka. Denotes payouts according to three handed deal.